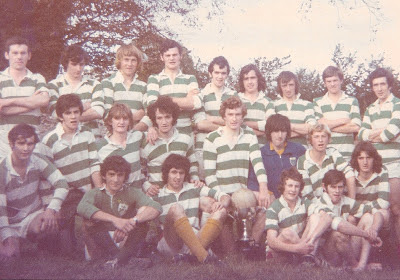 Back Row (L to R): P. Cashin, A. Barron, John Fraher, H. Kelleher, M. O'Connor, Jim Fraher, N. Cashin, M. O'Flynn. Kneeling (L to R): J. Beatty, J. Kelleher, M. Kiely, F. Shields, M. Hanrahan (Captain), J. Kiely, E. Cashin, V. Feeney. Seated (L to R): J. Moloney, D. O'Connor, R. Hanrahan, P. Flynn. This week's photo shows the Ballinacourty U21 Football team that won both the Western and County titles in 1971, thus retaining the championships won the previous year. The Western title was secured following a 2-8 to 0-2 victory over Ardmore in Fraher Field. Three months later a much tighter affair at the same venue saw Ballinacourty emerge victorious against Dunhill on a scoreline of 0-5 to 0-3 in the County decider.